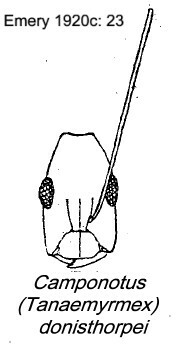 Type location Cameroun (Camponotus (Dinomyrmex) donisthorpei n. Emery, 1920c: 23, illustrated, minor worker) Conradt; minor worker only described (see Bolton, 1995) . 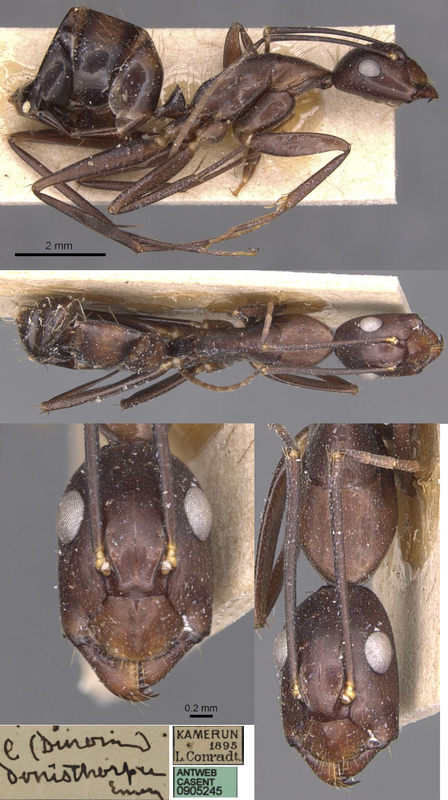 The photomontage of the (probable) type minor worker is collated from http://www.antweb.org/specimen.do?name=casent0905245. The photomontage is of a major from Cameroun, Boga; collector A. Fotso Kuate (Camponotus sp 14). The photomontage is of a minor from Cameroun, Boga; as above. The Emery dimensions for the minor were TL 8.5-9.0 mm, alitrunk 2.5, scape 3.1, hind tibia 3,2. This Cameroun specimen matches those and the general description. 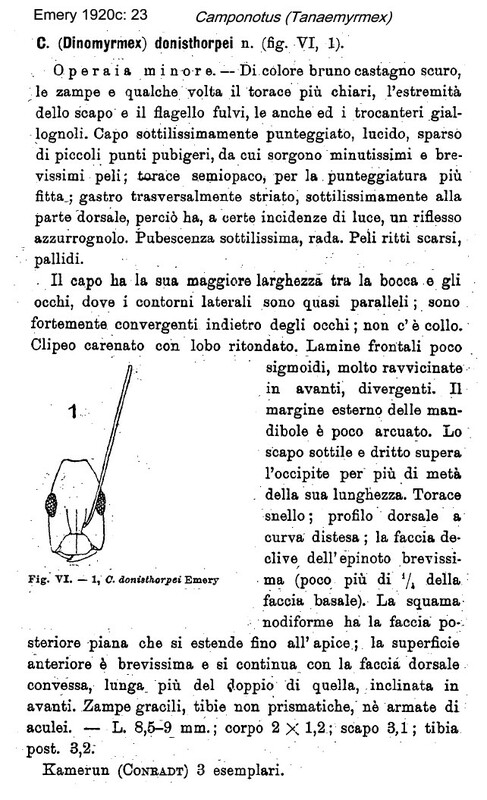 The photomontage is of a minor from Congo, R閟erve de L閟io-Louna; collector Eric Zassi (pitfall trap 19, t 1.1). The photomontage is of a specimen from the Central African Republic, Camp 1; collector Philippe Annoyer (CAR Camp 1E). This specimen is slightly smaller and obviously lighter coloured than that above and may be a related species.